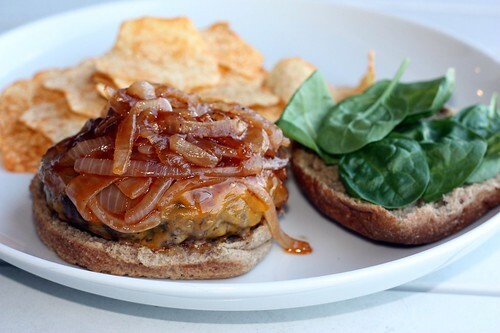 Sirloin Burgers with BBQ Caramelized Onions & Cheddar – Elly Says Opa! I’ve been on a burger kick lately. In fact, this is one of three burgers currently sitting on my camera’s memory stick, ready to be posted. And there may be another by the time I get around to posting them all! This burger is pretty classic as far as burgers go. The patty is simply seasoned and topped with sharp cheddar. 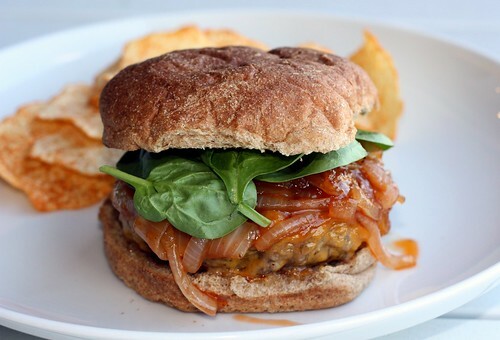 I love caramelized onions, so I decided to add those as well as some barbecue sauce to the burger, too. The barbecue sauce goes great with the cheddar and caramelized onions complement…well, pretty much anything. I used ground sirloin for these. I know there is a “rule” that you should make burgers with 80/20 beef or something similar, but I have always preferred the taste of sirloin, and since I don’t overmix or overcook the patties, I don’t really have much of an issue with them staying juicy and tender. Plus, sirloin is so much healthier. Of course, if you prefer a ground beef with a higher fat content, by all means, use that here, or use a mix of chuck and sirloin – which is a great way to get some more fat and juiciness from the chuck, and flavor from the sirloin. In a heavy-bottomed skillet over medium-high heat, add the oil. Once hot, stir in the onions and cook, stirring frequently for about 5 minutes. Add a pinch of salt, reduce the heat to medium, and continue cooking until the onions are a dark golden brown, about 20-25 minutes longer. Stir in the honey and cook an additional minute or so before adding the barbecue sauce. Meanwhile, lightly mix together the sirloin, salt, pepper, and Worcestershire. Form the mixture into four patties. Grill, broil, or pan-fry (I cooked them stove-top, in a cast iron skillet) until done to your liking. Add the cheese and cover the pan or grill, just to melt. Top the burgers with the onions and serve on buns with your desired garnishes.